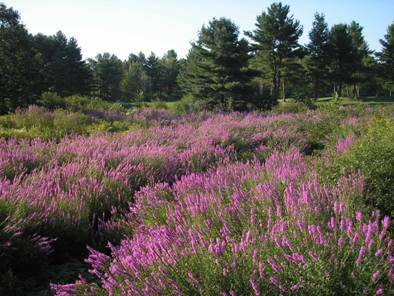 Purple loosestrife infestation at the Sable Oaks Golf Course in South Portland. Do you know if you have invasives on your woodlot or property? We can provide a wide range of Technical Assistance including identification, mapping of infestations, creating plan to manage & remove invasives. We work with individual landowners, land Trusts, municipalities. In June 2005 York County Soil & Water was awarded a grant through the National Fish & Wildlife Foundation. The Expanding Southern Maine Community Invasive Plant Control Phase 1 project encompassed developing an Integrated Pest Management plan (IPM), creating a steering committee, hosting workshops for ID & control of noxious weeds as well as distribution of education materials. We are also working with Noble High School to incorporate invasives in their curriculum. "Heather Dionne from York County Soils & Water District on Invasive Species had a really good point. What she said was the some companies and people accidentally spread invasive plants around the state, like Japanese Knotweed. What the plant would do is take over the surrounding environment because they have no competition. I agree with what she said, because that stuff happens all the time. A company will send out sand or soil for a house they’re making, and there will be an invasive plant or seeds in it, without them knowing." Phase 2 of this grant began in the spring of 2008. As a Maine Resident, Why Should I Care About Invasives? The York County Soil & Water Conservation District is a Non-Profit Organization all proceeds from our fundraising efforts are used to promote conservation and the wise use of our natural resources. The York County SWCD is an equal opportunity provider and employer.